Hello beautiful Friends! 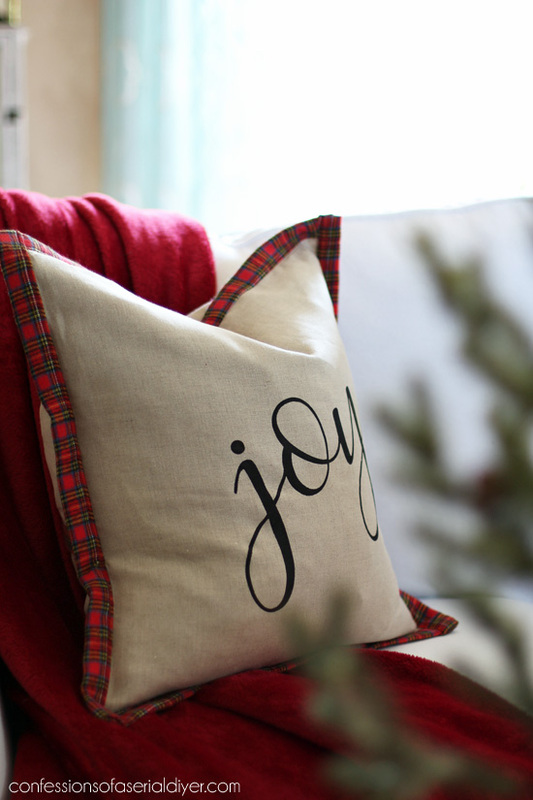 Are you feeling Jolly yet? My six year old has been going around singing, “Deck the halls of Holwy Jolwy!” all week, so I think he’s there. 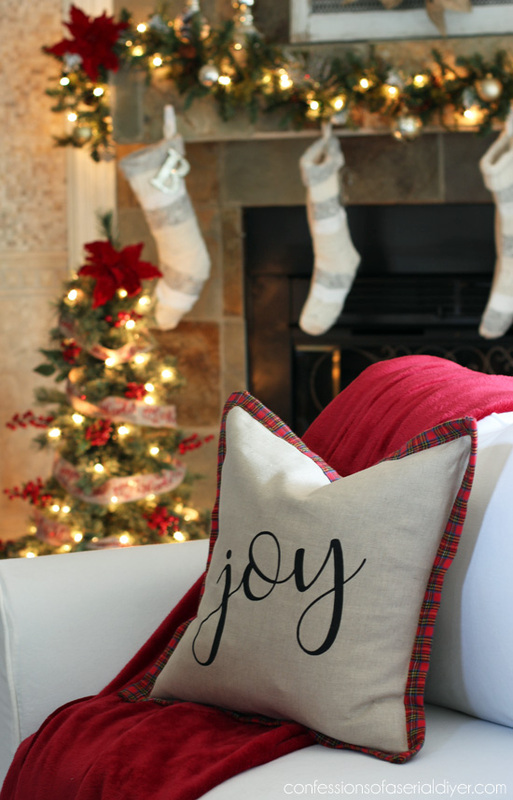 And I am just putting the finishing touches on my Christmas décor so I am almost there too! 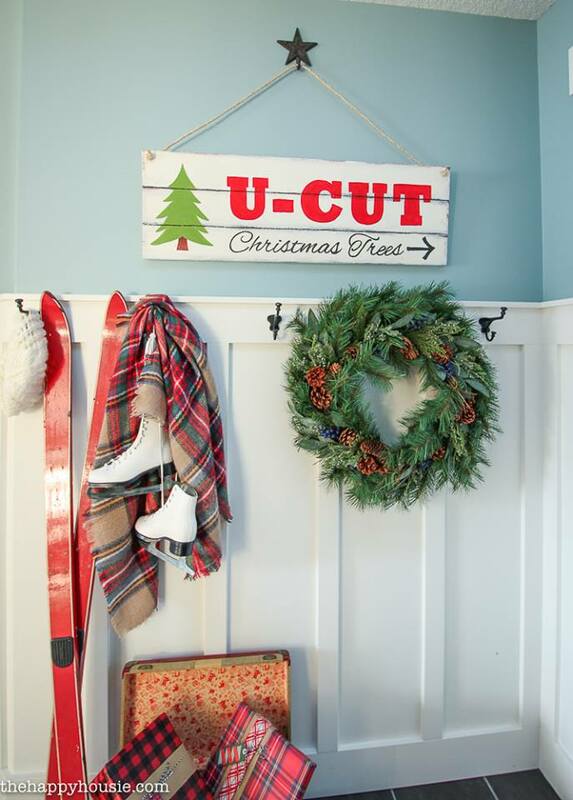 Today I am bringing you my first Holiday post of the season, a cute project I made for this month’s Get Your DIY On theme, “Knock-Off Holiday Décor”. 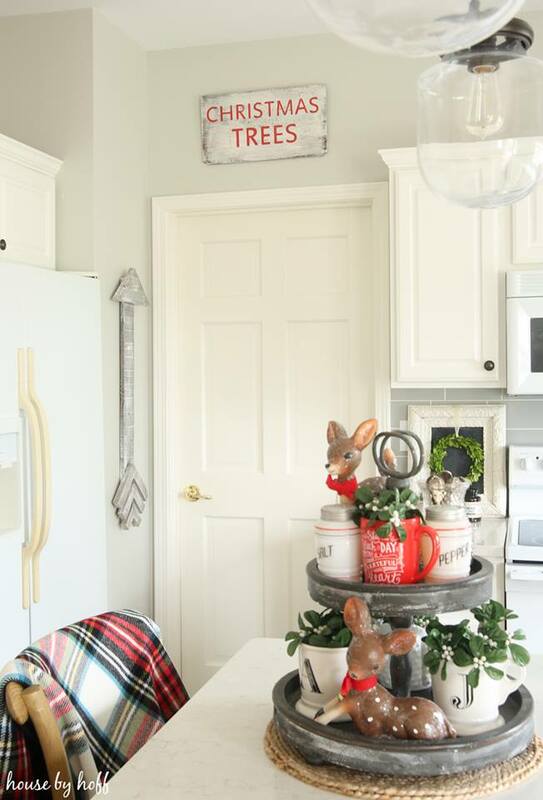 I know I usually post on Thursday and expected to as usual yesterday, but two of our party co-hosts had Christmas Home Tours they were involved in, so we decided to share our projects today instead. I loved it right away and knew I could make one myself. I have included a few affiliate links so you can find the products I love. I think it turned out pretty darned cute! I purchased several down inserts from IKEA when I was there a while back for only $5.99 each. 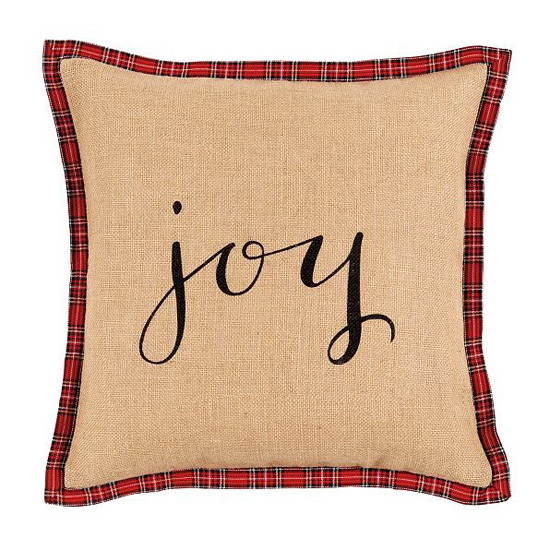 The only plaid fabric I could find was this flannel, but I think it adds a cozy factor. The other fabric is linen. 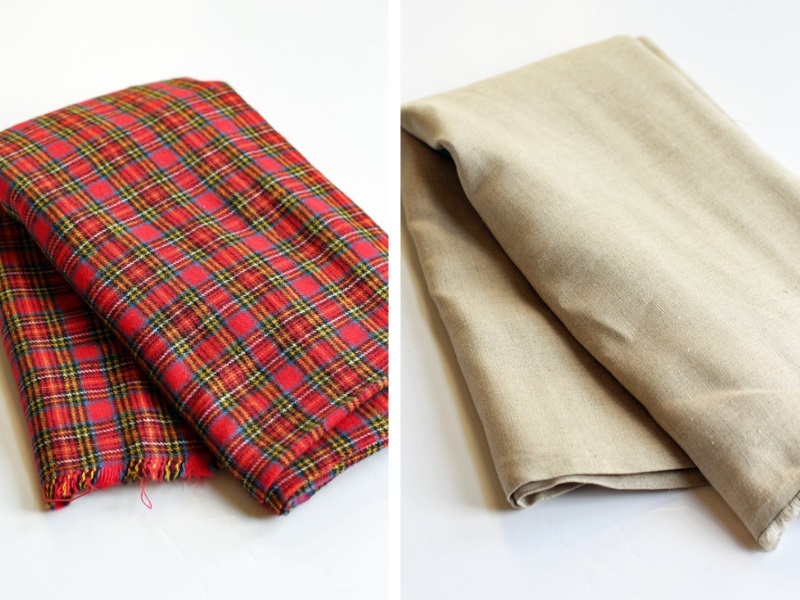 I used about a third of a yard of the plaid and about a yard of the linen, both on a good sale last weekend. Making them was pretty easy! 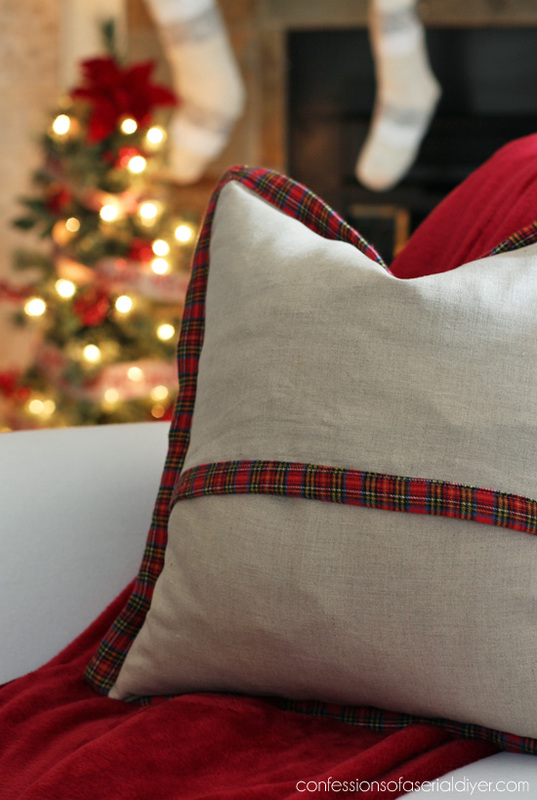 If you’re looking for new pillows to add to your Holiday décor this year, don’t want to spend a fortune, and can sew a straight line, here’s how to make this one. I created my wording using the Marchy Script font, and uploaded it to my silhouette machine. (I have this one.) Yes, it even works wonders on fabric! 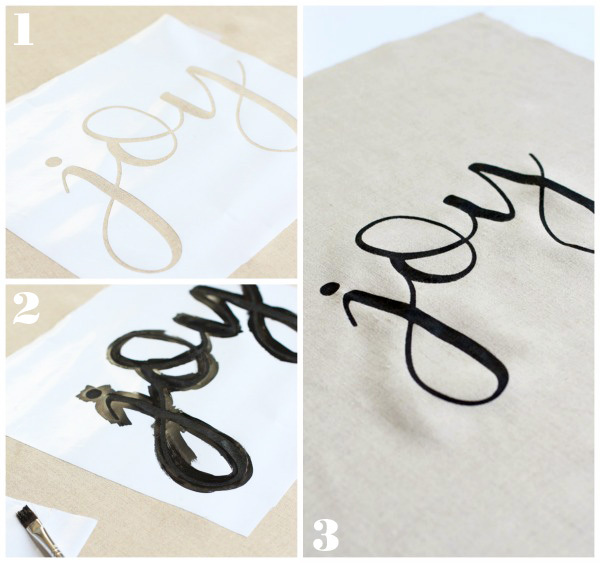 I used contact paper to cut out this “stencil” and black acrylic paint to fill in the letters. It made a perfectly sharp transfer. Then I ironed it flat to remove the puckering you see above. 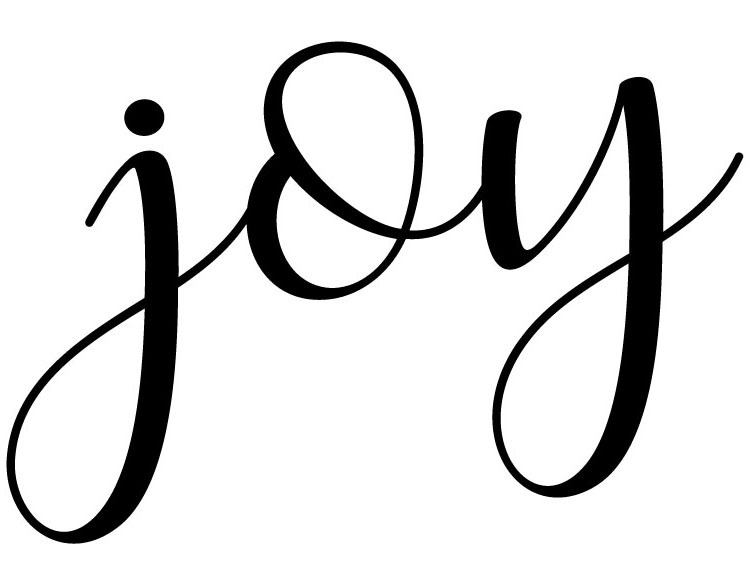 Here is a pdf of the “Joy” for your own use if you have a silhouette: If not, this probably wouldn’t be too hard to free hand with pencil, and then paint in either. 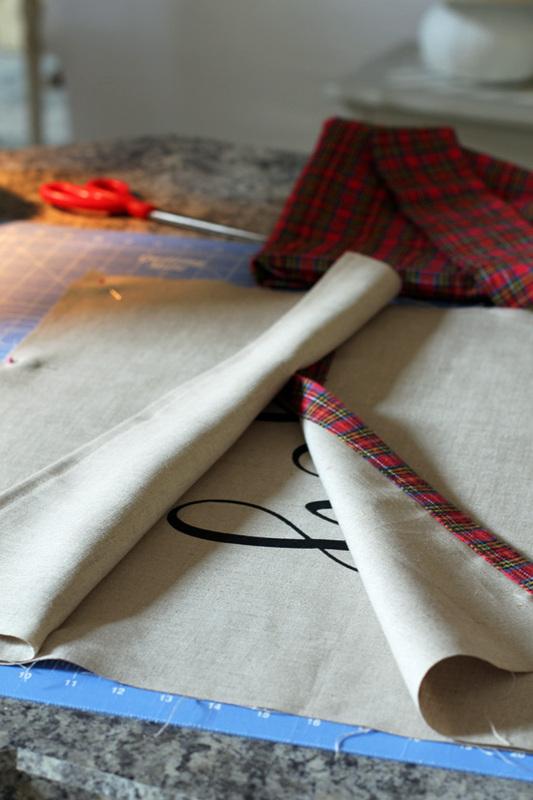 For the back of the pillow, fold over the raw edge of one side 1/4″ then fold again and iron flat, sew in place. 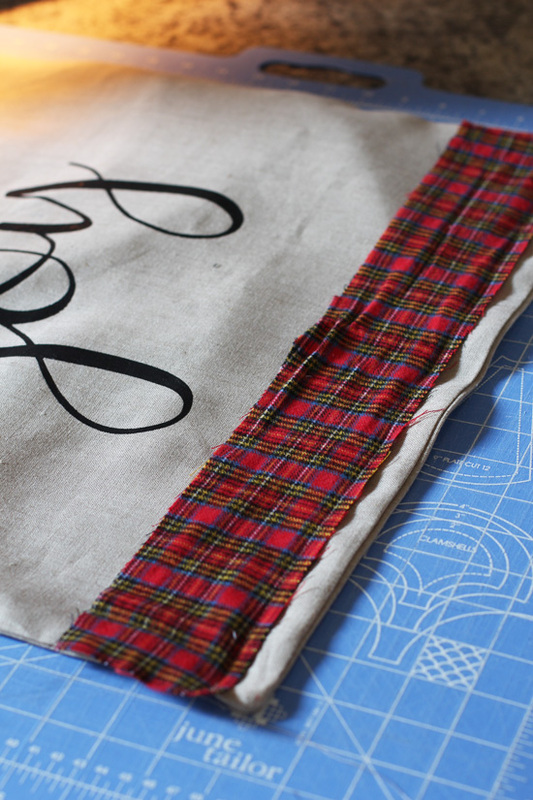 You can see I added a strip of the plaid to the other back piece instead, totally optional. 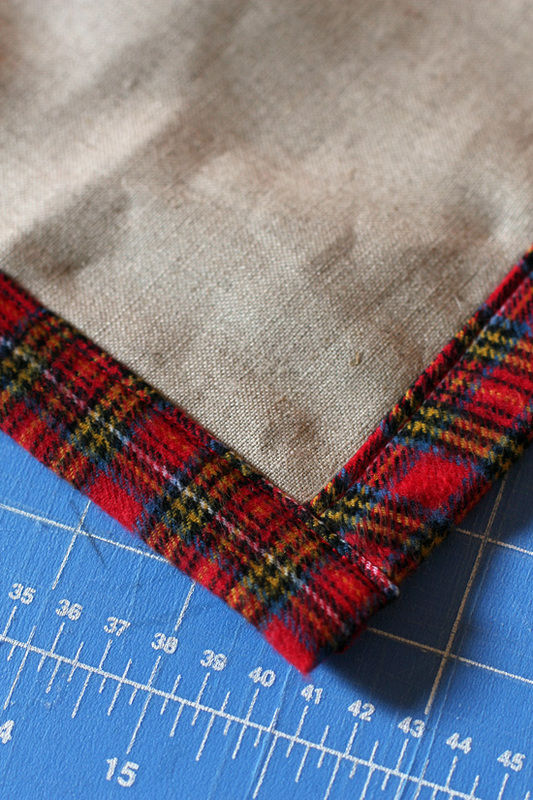 I added this the same way I added the binding, so if you like this addition, see the instructions for the binding. 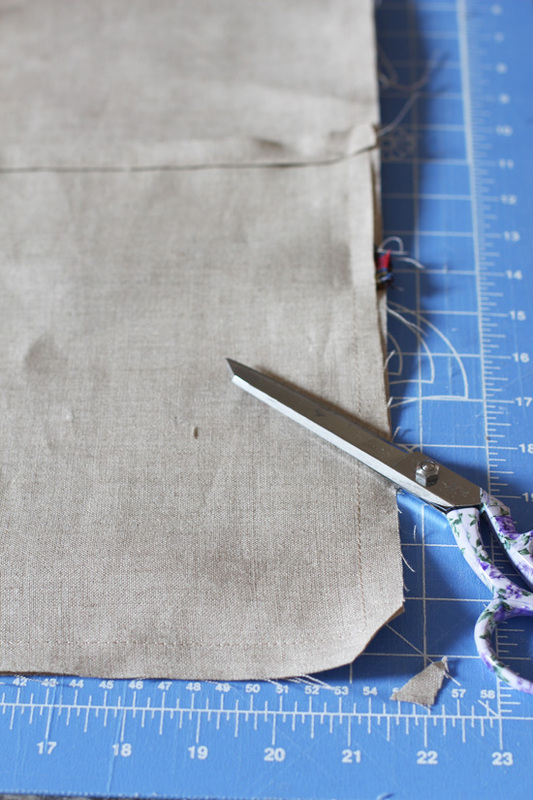 You will need to cut a 3″ strip, 21″ long for this piece. If not, finish off one edge of the other back piece the same way as the first. 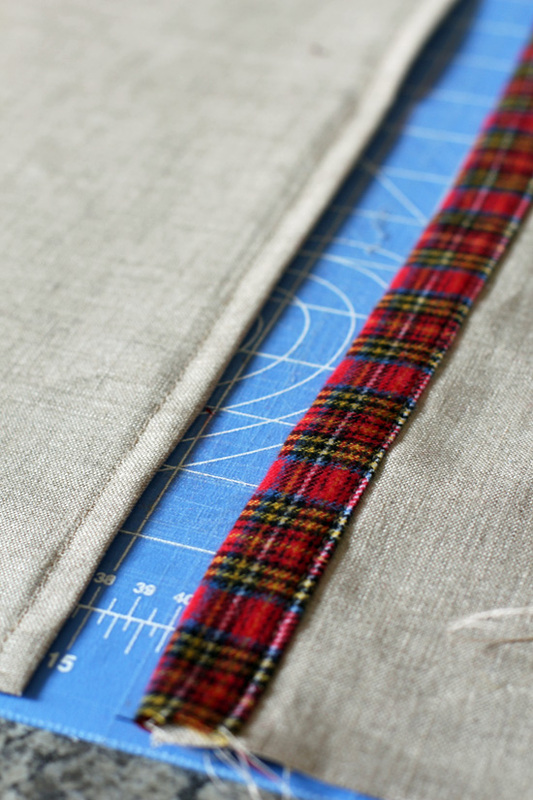 Sew all around the outside edge, clip corners. 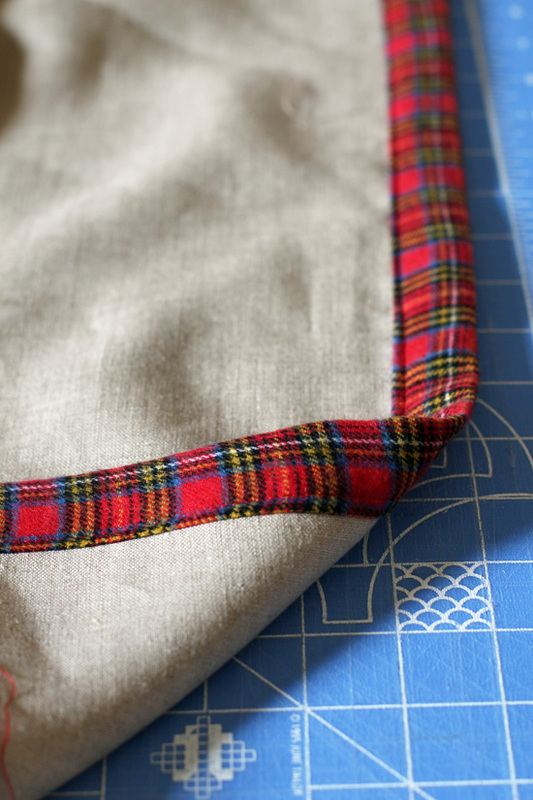 Seal your edges to prevent fraying in the wash by adding a zigzag stitch all the way around the outside. Turn right-side-out and press. Time to add the binding. 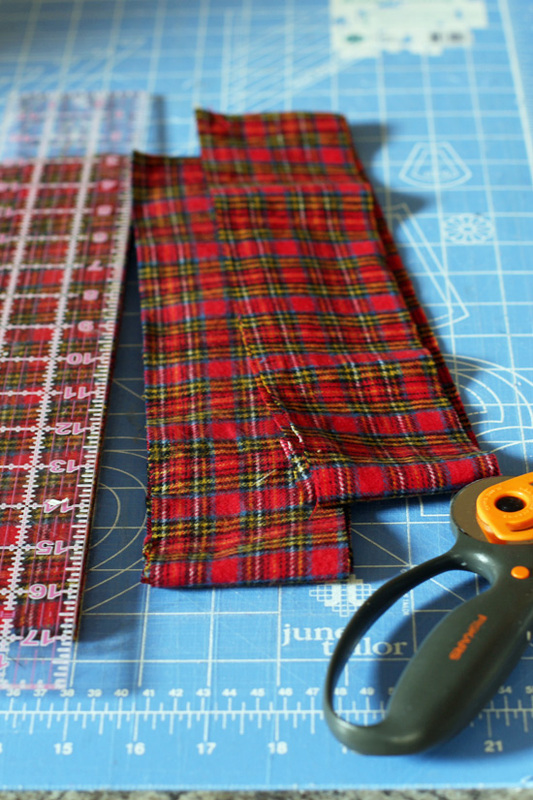 Cut two pieces of the plaid the length of two of the finished sides. Sew in place. Repeat on opposite side (top of pillow). 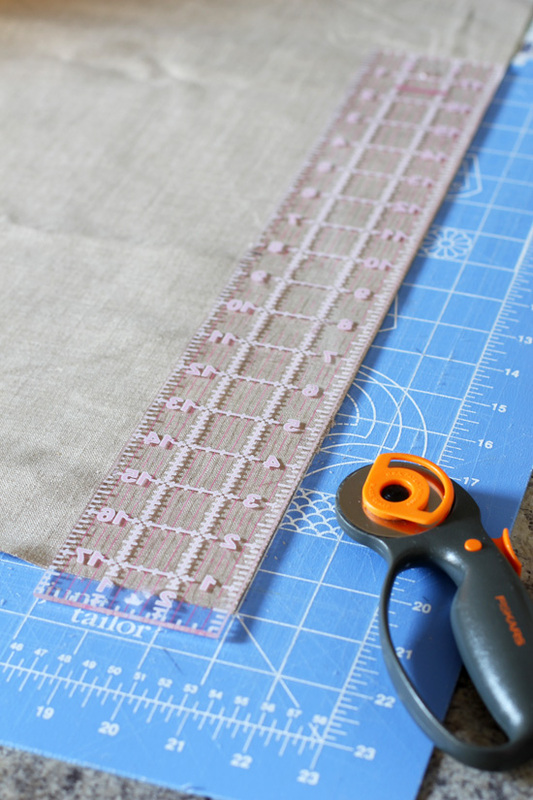 Cut a piece for each of the two sides, about an inch longer than the finished length. 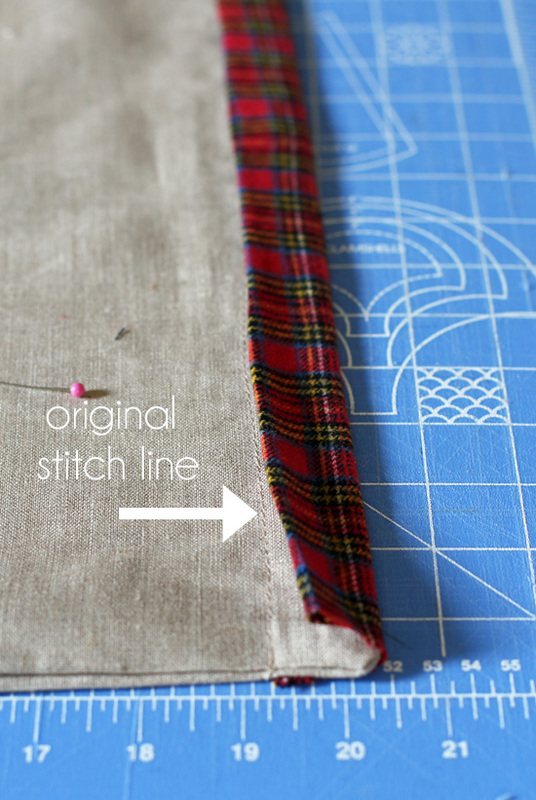 Sew those in place the same way, leaving about a 1/2″ hanging off of either end. 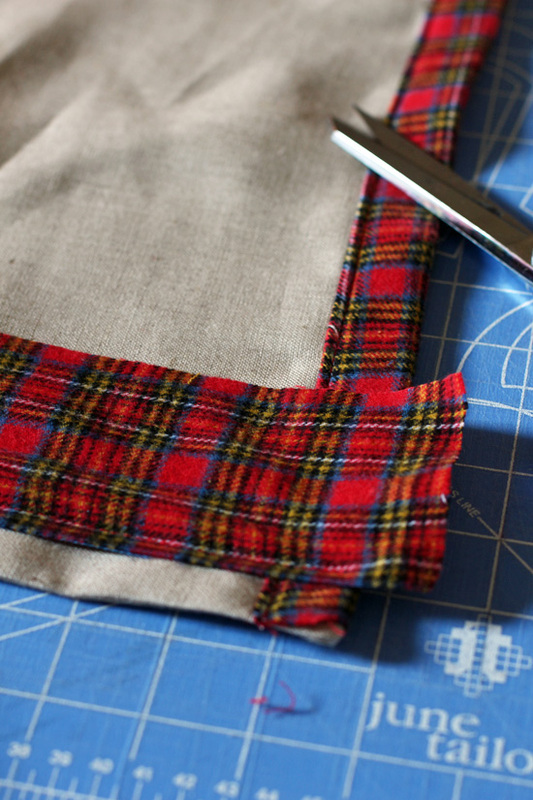 Fold extra lengths on either end over around the back before folding the entire side lengthwise. I used to make pillows all the time. They really are such a simple way to beautify your space without spending a fortune. 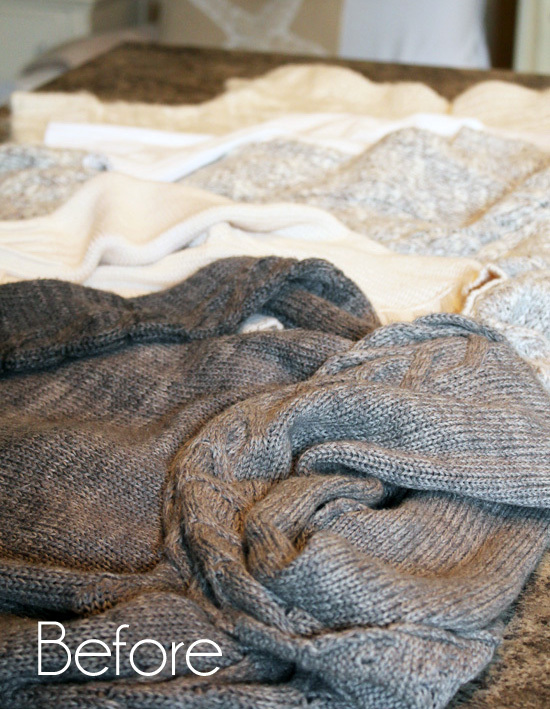 And you can easily just change out the covers to match the seasons! 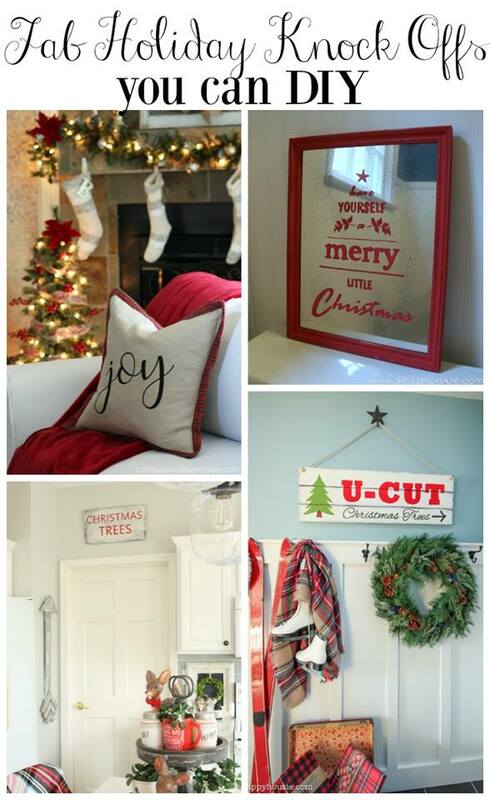 My Get Your DIY On Girls are also sharing Knock-off Holiday Décor today! Check out what I made with them HERE. 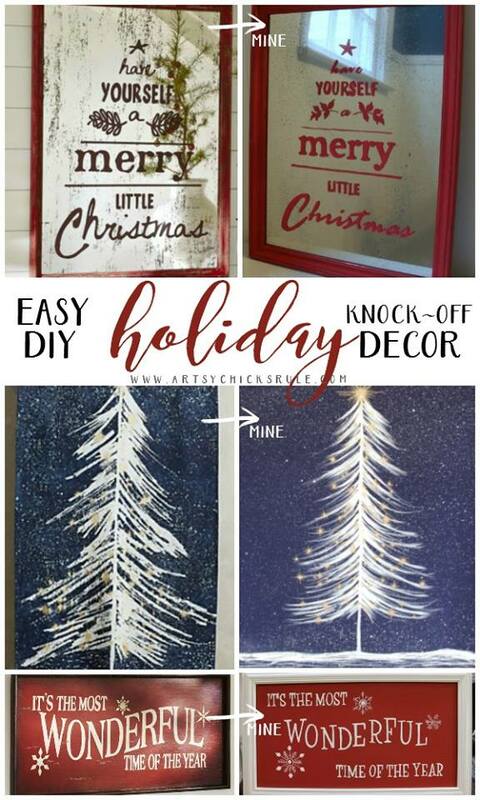 I’ll see you back here on Sunday at 7:00 pm EST with our Get Your DIY On Party! 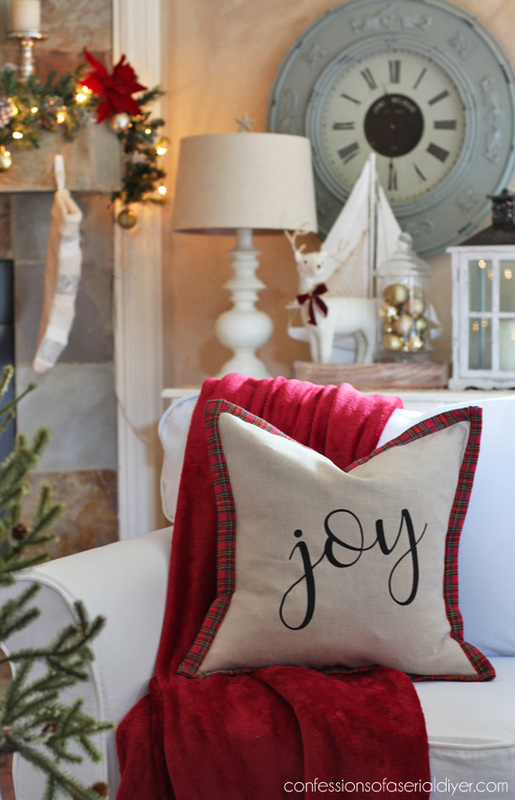 Bloggers, come by and share your knock-off holiday décor, and awesome readers, come by and get inspired by what they share! 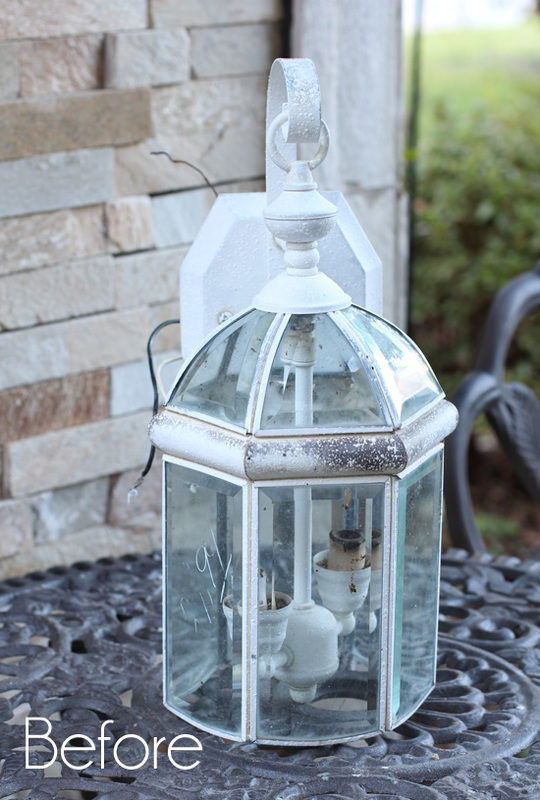 UPDATE: Check out the super cuteness that is this light fixture now HERE! 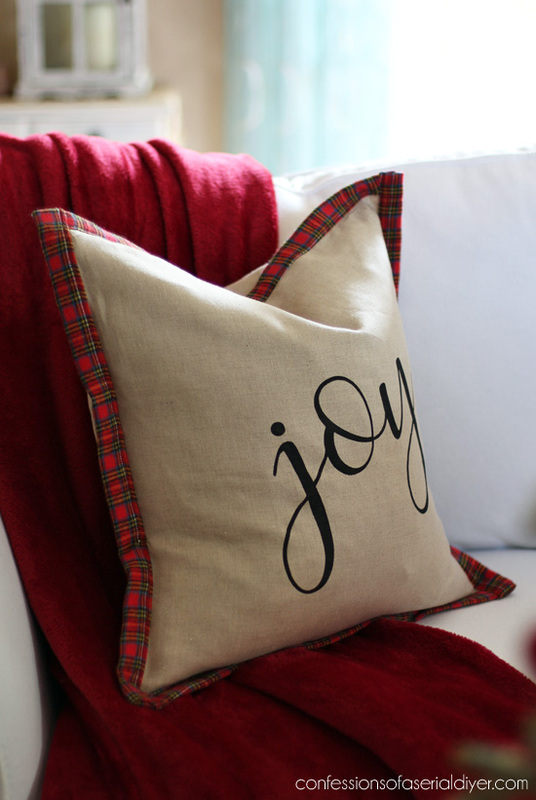 LOVE LOVE LOVE the pillow! JOY is my favorite word!! Thanks for sharing!!! Beautiful job!! Your pillow is so cute!!! Love it. Sure wish I could sew!!! Can’t wait to see what you did with the lantern. Well done, Christy. A very Holwy Jolwy Christmas to you! It’s beautiful!! I have to say I like your much better. 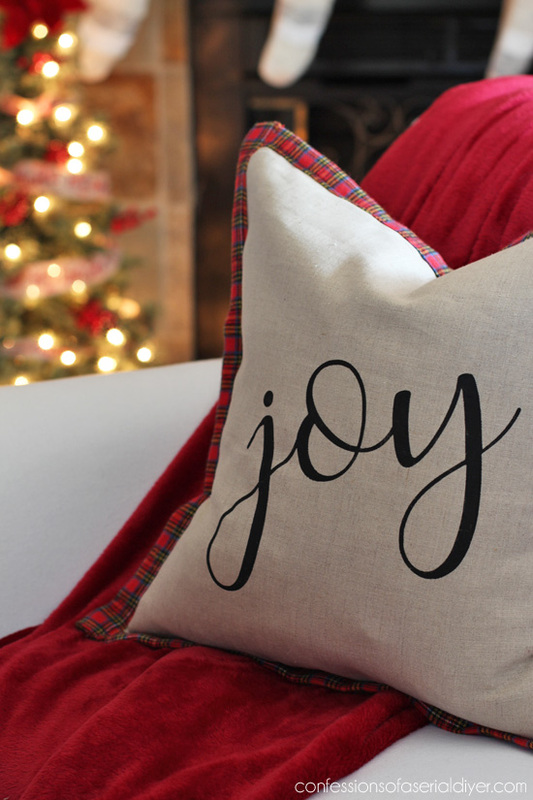 I like the way the JOY came out much better, (one of my favorite Christmas words). 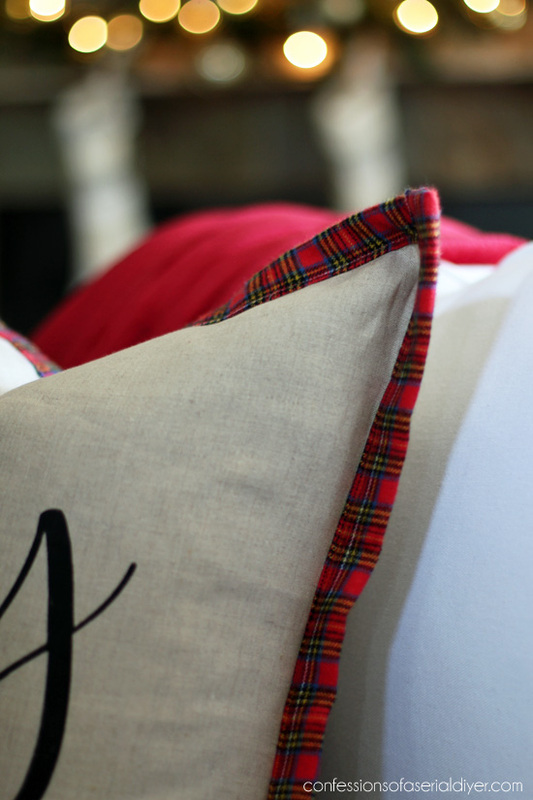 Love your pillows Christy, they are just beautiful. 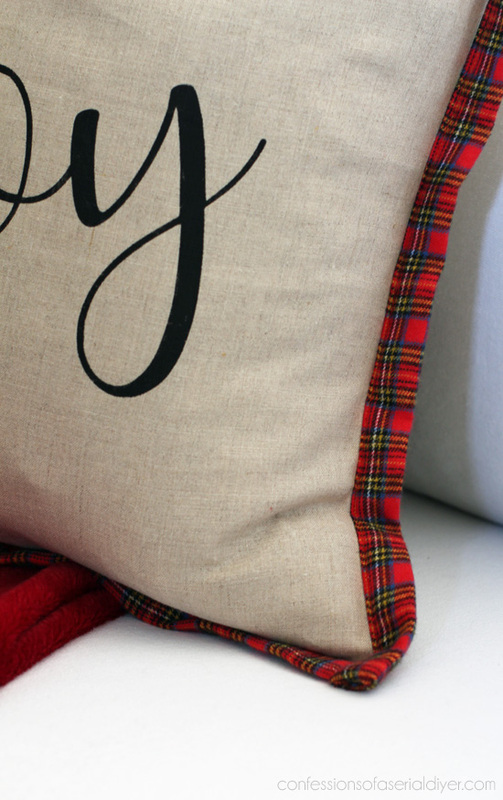 Nothing says Christmas like red plaid, it is so warm and welcoming. Can’t wait to see what you do with that light fixture. That pillow is sooooo cute!! You amaze me, you are so talented. You should sell these in your shop, you’d make a killing. I know I would buy one if I could come to your shop. This looks fabulous Christy!! I love it – such a fab replica!! Beautiful job! In fact, I like your version better. I think the lighter shade of the pillow looks classier. Is there nothing you can’t do. I have so enjoyed your website since subscribing a few weeks ago. Excited every time I get an email from you. Keep it up.